Angry Birds was released in December 2009 and thanks to its highly addictive gameplay it soon became the most successful mobile game of all time. In this Tutorial we will implement a Angry Birds clone in Unity. The most complex part of the game is the physics system, but thanks to Unity we won't have to worry about that too much. 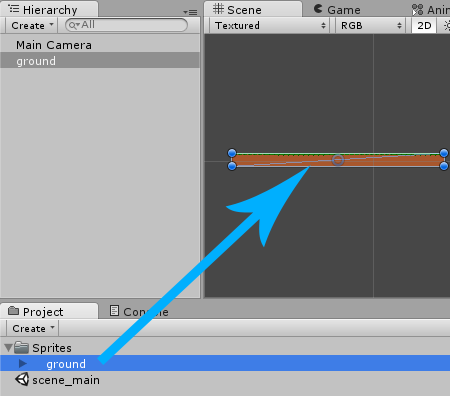 Using Unity will make it so easy that we will only need about 100 lines of code! As usual, everything will be explained as easy as possible so everyone can understand it. Our Tutorial does not require any special skills. If you know your way around Unity and heard about GameObjects, Prefabs and Transforms before, then you are ready to go. In this Tutorial we will use Unity 5.0.0f4. Newer versions should work fine as well, older versions may or may not work. The free version of Unity 5 now comes with all the engine features, which makes it the recommended version. In order to prevent Copyright issues we can't use the original Angry Birds graphics in this Tutorial. Instead we will draw our own Sprites and make them look similar to the original game. Note: a Pixels to Unit value of 16 means that 16 x 16 pixels will fit into one unit in the game world. We will use this value for all our textures. We chose 16 because the bird will have a size of 16 x 16 pixels later on and we want it to have the size of 1 unit in the game world. Right now the ground is only an image, nothing more. It's not part of the physics world, things won't collide with it and can't stand on top of it. We will need to add a Collider to make it part of the physics world, which means that things will be able to stand on top of it instead of falling right through it. Now we will add some kind of invisible area to the left, right and top of our level. And whenever something enters that area then it should simply be destroyed. This kind of behavior can be implemented with a Trigger, which is pretty much just a Collider that receives collision info but does not collide with anything. After saving the Script, our borders are finished. We will see later on that if we try to fire a bird outside of the level, it will simply disappear. Note: by just using a few repeating patterns and some very colors we can make the level look pretty good without much effort. Later on we will create a Script that spawns a new bird at the slingshot's position, or to be exact at the slingshot's Pivot. We will want to spawn the bird at the top of the slingshot instead of the center, this is why we set the Pivot to Top in the Import Settings. Note: if we set the Pivot to Center then transform.position is the point at the center of the slingshot. If we set the Pivot to Top, then transform.position is the point at the top of the slingshot. As mentioned before, our Slingshot is supposed to spawn the birds. To be exact, it should spawn one in the beginning, then wait for the user to fire it and then spawn another one as soon as all the physics calculations are finished (when nothing moves anymore). The Start function is automatically called by Unity when starting the game. The Update function is automatically called over and over again, roughly 60 times per second. We won't need either of them so we can delete them from the Script. There is yet another type of Update function, it's called FixedUpdate. It's also called over and over again, but in a fixed time interval. 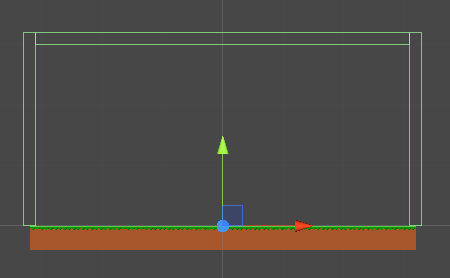 Unity's Physics are calculated in the exact same time interval, so it's always a good idea to use FixedUpdate when doing Physics stuff (which we will very soon). Now we can't just spawn one bird after another. Instead we will have to spawn one and then wait for it to be fired. There are several ways to implement this, but the easiest is to use a Trigger. A Trigger is simply a Collider that receives collision information but is not actually part of the physics world. So if we add a Trigger to our Slingshot then we will get notified whenever something enters that trigger, stays in that trigger or leaves that trigger. However since it's just a Trigger, things won't collide with it like they would with a normal Collider (this will make more sense soon enough). After adding the Trigger, we will get notified whenever something enters (OnTriggerEnter2D), stays(OnTriggerStay2D) or leaves(OnTriggerExit2D) that green circle shown above. // Is there a Bird in the Trigger Area? // Bird not in Trigger Area anymore? Note: !occupied means not occupied. We could also use if (occupied == false). Our Spawn Script would work just fine now, but let's add one more feature. After shooting a bird, there will be plenty of things colliding with each other, falling down, rolling around or perhaps even exploding. In the original Angry Birds game a new bird is only spawned after all the things in the level stopped moving around. Note: we used the FindObjectsOfType function to get all the Rigidbodies in the Scene. 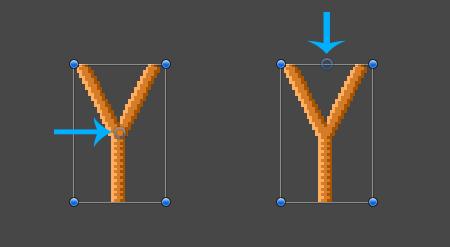 Afterwards we check each Rigidbody's velocity, which equals the movement direction * speed. We then calculate the velocity vector's length by using sqrMagnitude and check if it's bigger than 5, in which case the object is still moving pretty fast and we return true. If none of the Rigidbodies are still moving then we return false. // Bird not in Trigger Area anymore? And nothing is moving? Note: we can't test the Spawn Script without the Bird yet, but it does work just fine as we will see after creating the bird. Note: the higher the Bounciness value, the more the bird will bounce. The bird is also supposed to move around. A Rigidbody takes care of stuff like gravity, velocity and other forces that make things move. As a rule of thumb, everything in the physics world that is supposed to move around needs a Rigidbody. Note: we set the Gravity Scale to 4 because it makes the bird fall a bit faster. Now the Rigidbody is kinematic, which means that it's not effected by gravity or velocity, hence it won't fall down immediately. Note: to make this more clear, anything like a hero, a car or a bird should have a Rigidbody with Is Kinematic disabled. We only enable Is Kinematic as long as the bird is still in the slingshot. As mentioned before, the bird should not be in the Scene from the beginning. Instead the slingshot should spawn a new bird when needed. In order for the slingshot to be able to spawn the bird, we will have to create a Prefab (or in other words, we have to save the Bird in our Project Area). The user should be able to pull the bird around in the slingshot and then release it in order to shoot it into the wished direction. Note: we also removed the Update function because we won't need it. Alright, now in order to let the user drag the bird around in a circle we will have to find out if the bird was clicked (to be exact: dragged). We will also need to know if the user released the mouse, in which case we have to fire the bird towards the wished direction. Note: a MouseDrag happens if the user holds down the mouse button over a GameObject and then moves the mouse. Note: we have to use ScreenToWorldPoint because the mouse is always somewhere between (0..width, 0..height), while the game position under the mouse can be just about anything, depending on the camera position. After finding the world position p, we simply calculate the vector from startPos to p. If this vector is too long (sqrMagnitude > radius) then we shorten it with dir.normalized * radius. Alright, let's add our Script to the Bird by selecting it in the Project Area/Prefabs folder and then clicking on Add Component->Scripts->Push And Release. Note: as mentioned before, we will also disable isKinematic, so that the Rigidbody is effected by gravity and velocity again. We calculated the direction by simply subtracting the current position from startPos. Finally we remove the PushAndRelease Script from the bird so it can't be fired again afterwards. At first we will create a new Particle System by selecting GameObject->Particle System from the top menu. Afterwards we can select it in the Hierarchy and then rename it to feathers (right click and select rename, or press F2). A Particle System is used whenever we need random particles to spawn, rotate and move into some direction. A simple example for a Particle System is smoke, where a gray texture is spawned and then moved upwards in a cone shape. Afterwards we can drag the image from the Project Area into our Particle System so it uses the image for all the particles. 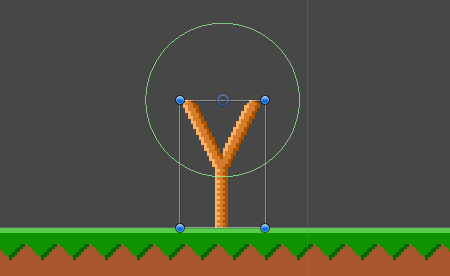 Afterwards we can then delete the feathers GameObject from the Hierarchy. Note: to make sure that the effect is only spawned once, we will remove the Script from the bird with Destroy(this) (which only destroys the Script, not the whole bird). Note: right each image, select Save As... and save them all in the project's Assets/Sprites folder. Let's add some structures like stones, ice and wood to our Unity 2D Angry Birds game. Now we have a piece of wood that's part of the physics world! Note: yet again we achieved some decent looking visuals with basic shapes, only a few colors and dithering. We will add one more structure to our game: ice. This time it will be a bit more interesting though. Note: Collision2D is the info that gets passed to the OnCollisionEnter2D function. It contains the relativeVelocity, which is pretty much the direction multiplied with the speed. If we only care about the speed then we can calculate the length of that vector by using sqrMagnitude. Now if the object that caused the collision also has a Rigidbody then we will multiply the speed with the Rigidbody's mass. Otherwise we return only the speed. The birds want to destroy all the pigs, so let's add some pigs to our game so the birds don't get bored. Note: being able to re-use Scripts like this is what makes component based development so awesome. Note: this time we set the Pivot to Right to make some rotations easier later on. Note: now whenever we move the slingshot, the rubber parts will move with it. The purpose of this Script is to make the two rubber parts follow the bird until it leaves the spawn's trigger circle. Note: at first we calculate the direction from the bird to the rubber. Then we calculate the angle of this direction. Afterwards we set the rubber's rotation to that angle by using Quaternion.AngleAxis. Finally we use basic vector math to calculate the distance between the rubber and the bird. Afterwards we set the horizontal scale to that distance (plus half the width of the bird, which is bounds.extents.x). 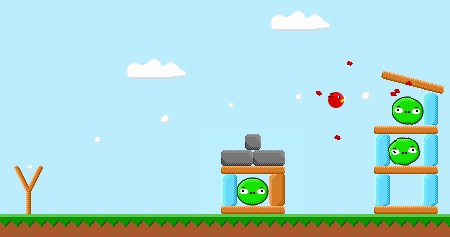 We just created a nice little Angry Birds clone in Unity. There was a whole lot of stuff to learn. We used simple shapes and colors to achieve a nice visual effect. We made extensive use of Unity's 2D Physics system and added a whole lot of effects to our bird. All these little tricks like breakable ice, a bird that spawns feathers when it collides with something and a trail that marks the trajectory are what makes the game feel right later on. This is why it's so important to keep the game small and focus on each little detail to make the game feel right.